These Cheese filled pasta rounds look simple, but your first taste will convince you otherwise. First, we make the ravioli using only the finest gourmet Ricotta, Parmesan, Romano, and Mozzarella cheeses combined with a special blend of gourmet seasonings and spices. 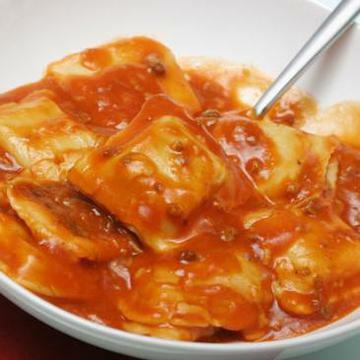 The taste explosion doesn’t stop there...we then simmer fresh tomatoes, garlic, onions, herbs and spices for hours and press it through a food mill to create a deliciously smooth and thick sauce, a perfect marinara to drench the ravioli with! Prepare from THAWED state for best results.To thaw product, remove from freezer on the morning of the day of use. Product may be refrigerated up to 3 days prior to use. Individual appliance cooking times will vary. Adjust cooking time accordingly.� Oven�Preheat oven to 350� F. Remove plastic packaging from paper tray. Cover paper tray with foil and place in oven. Heat for 15-20 mins or until warm, stirring periodically. Remove foil and heat 5 minutes longer or until lightly browned Carefully place pasta onto a plate and serve. Microwave: Remove plastic packaging from paper tray. Place tray on a plate in the microwave for heating. Heat for 3-4 minutes stirring periodically. Carefully place pasta onto a plate and serve.